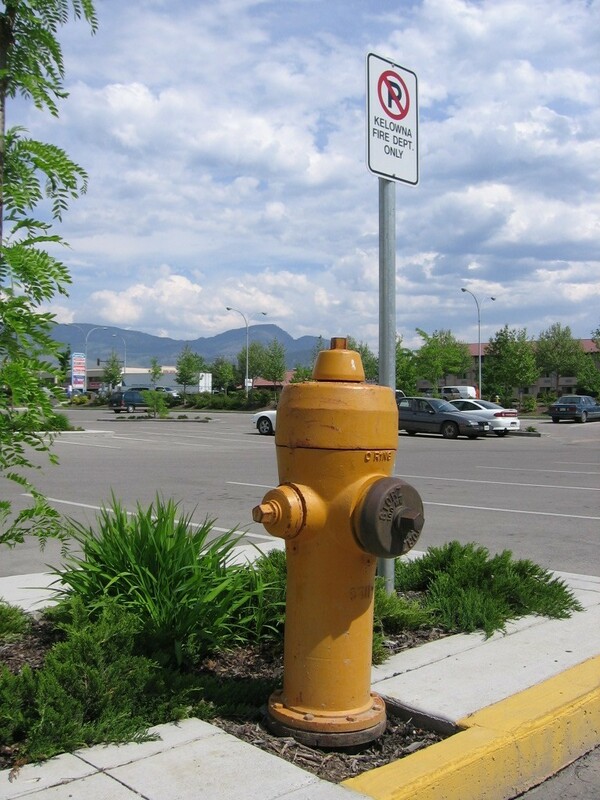 Fire hydrants have been installed throughout Kelowna to ensure our crews have an accessible and adequate water supply when required for fire suppression. Don’t park too close to a fire hydrant. An area having a radius of one (1) meter around each fire hydrant or standpipe shall be maintained clear and unobstructed, and each such hydrant or stand-pipe shall be located in clear view from the roadway while approaching thereto from either direction. No person shall make any attachment or connection to any hydrant or standpipe on public or private property without the authority of the Chief and local water improvement district. If you need to use water from a fire hydrant call your water provider as listed on your bill and obtain a hydrant use permit. Please note that permits will not be issued for private hydrants. Private hydrants can be found in private parking lots, industrial complexes, apartments and strata developments. Private hydrants are to be used for fire suppression only. Permits will not be issued for any other use. The City of Kelowna Water Utility does not inspect or repair private hydrants. Please consult the yellow pages of your telephone book under "Fire Protection & Prevention Consultants" for a listing of companies that inspect and repair private hydrants. Hydrants shall be maintained in operating condition. No person shall make any attachment or connection to any hydrant on public or private property without the authority of the Fire Chief and local water improvement district. An area having a radius of one (1) meter around each fire hydrant shall be maintained clear and unobstructed, and each such hydrant shall be located in clear view from the roadway while approaching thereto from either direction. Hydrant(s) shall be inspected at intervals not greater than 12 months and after each use. The type, capacity, colour, location and maintenance of each fire hydrant on privately owned lands shall be subject to the approval of the Fire Chief. Records of inspections and tests on the hydrant(s) shall be submitted to the Fire Chief on an annual basis and after each use. Hydrants shall be inspected to ensure that hydrant caps are in place and caps with worn, rusted or obstructed threads which might hamper easy removal, shall be repaired or replaced. Hydrant barrels shall be inspected to determine if water has accumulated as a result of a leaking main valve or a plugged or damaged drain valve. Hydrants shall be flushed at intervals not greater than 12 months with the main valve and any outlet valves fully opened until the water runs clear. If the water flow is not known, contact your hydrant maintenance people who may have to flow the hydrant to determine the flow. Records of the flow shall be submitted to the Fire Chief.